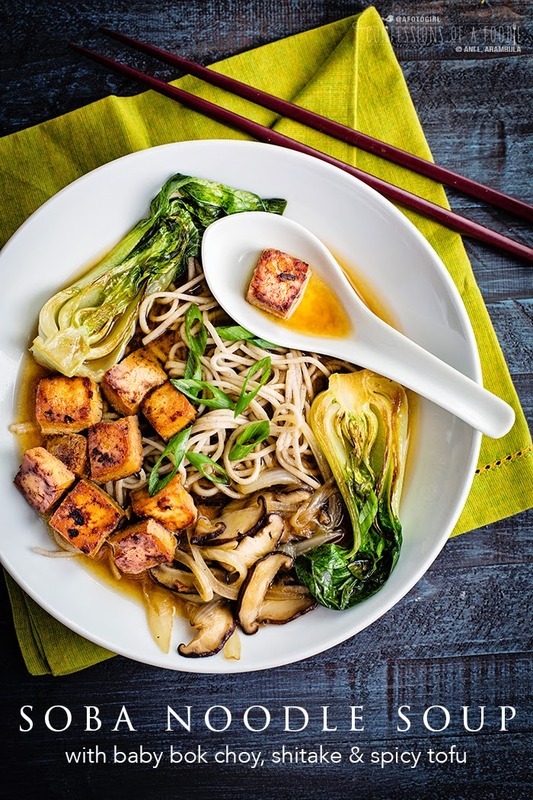 A simple comforting soup that is much in the tradition of pho but uses lower carb soba noodles and a spicy baked tofu for a boost of vegan protein. 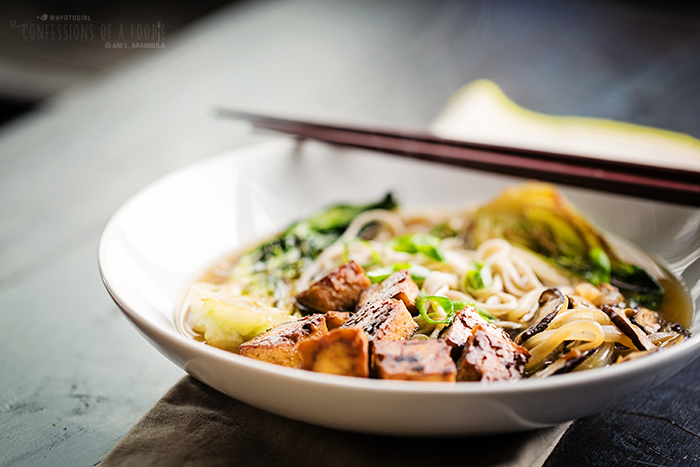 This pho-like noodle soup combines healthier soba noodles in place of rice noodles, shitake and crunchy baked tofu for protein and texture in a slow simmered ginger and anise flavored vegetable broth. Totally delicious, satisfying and healthy for Meatless Monday. Up to this point, you’ve wasted time trying to be “perfect” in so many ways, feeling like you have to do everything twice as good as everyone else. Stop. Just stop. There is no such thing as perfect. You have nothing to prove. So stop wasting so much energy suppressing who you are, trying to mold yourself into what you think other people want you to be in order to fit in. You are not a follower. You were born to be a leader. So lead. You’ll eventually find that as you become more comfortable with who you are, doing the things you love passionately, the right people – good people – will gravitate towards you, not only accepting you for who you are but cherishing the talents you have to share and cheering you on. You have had dreams of having your own family ever since you were a little girl playing with your Ken and Barbie. Right now, you are telling yourself that someday you’ll focus on finding and making a family but that for now, your focus needs to be on your career and perfecting your craft. Yes, those things are important. But you’re lying to yourself. It isn’t your career keeping you from finding love. It’s you. Stop being so afraid to be a woman. Allow yourself to meet people, to date, to be vulnerable, to let a man into your life or before you know it, it will be too late for you to have children and you will find yourself in mid-life without the family you so desperately want. Life is so fleeting. I know that at 20 years old, you feel like you are just starting out and you have so much time ahead of you. You laugh at people who tell you that it goes by quickly. I implore you, don’t laugh. It does. Before you know it, more years will be behind you than ahead of you. Cherish the time you have. Live each day the best you can. Find the humor in life and laugh as much as you can. Seek out friendships, invite love into your life with open arms and love with every fiber of your being. Make memories. Lots and lots of memories. Don't forget to take some time to be grateful for those memories even writing them down, recording them in some way so you don’t forget all the wonderful little things. Trust me, you’ll find yourself looking back and trying to remember what happened when but the details will be fuzzy and frayed and that will fill you with sadness. Life is too precious to waste feeling sad. Above all else, don’t be afraid. Be bold. Be brave. Do your best and have faith that God will take care of the rest. For the photo, I left the bok choy split in half. For presentation, this is really quite lovely but you might find it easier to eat if after caramelizing, you remove to a chopping board and rough chop before adding to soup bowls. Soba noodles are a good choice for diabetics and people watching their carb intake who would like to occasionally enjoy noodles/pasta. I use it in place of spaghetti in Italian dishes, and for cold noodle salads as well as for chicken noodle soup. I have tried a lot of different soba noodles from 100% buckwheat to buckwheat/whole wheat blends. I prefer the texture of the blends and my favorite by far is the Hakubaku brand of organic noodles. You can find them at Sprouts, World Market, Whole Foods and several other major supermarkets in the Asian food section. They come in three packets per package, each packet supposedly being a serving. I find it way too big of a portion and use half a packet per serving. Adjust the nutritional info accordingly when working out your carb intake. For the heat in the tofu sauce, I used harissa because that’s what I had on hand. Feel free to use Sriracha or any hot sauce you like or even a pinch or two of crushed red chili pepper flakes. 1. Slice tofu in half. Place on a towel lined plate. Cover with another towel and place second plate on top. Add several cans to the plate to weight it down and allow the water to be pressed from the tofu for at least 30 minutes. 2. Add all the broth ingredients to a large sauce pan and place on medium low. Allow to simmer while tofu is pressing and the rest of the ingredients are prepared, at least 1 hour. 4. 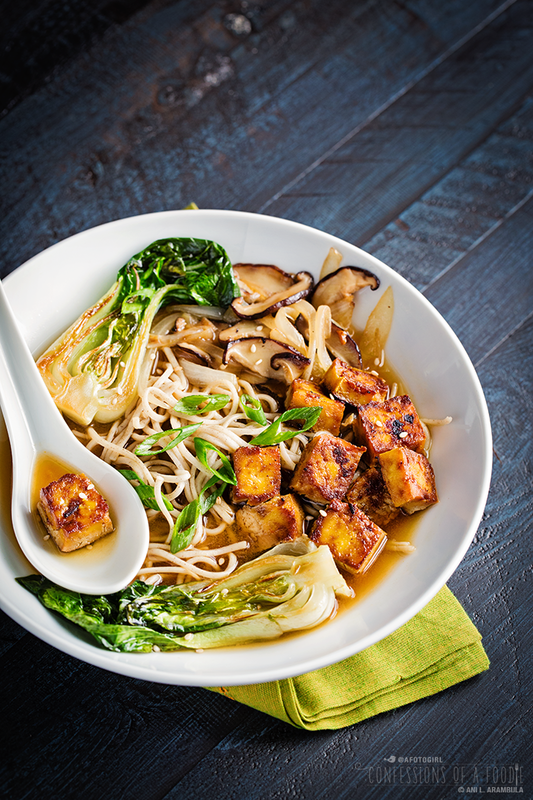 Place all the ingredients for the tofu sauce in a medium bowl and whisk to combine; set aside. 5. Remove weight from tofu. Cut tofu into 1-inch cubes. Spray a large rimmed baking sheet with cooking spray. Spread tofu out on tray making sure tofu cubes aren’t touching. Bake for 8 minutes. Remove from oven and flip. Bake for an additional 8 minutes. Remove from oven and transfer tofu to sauce bowl, tossing to coat well. Allow to sit in the sauce for 5 minutes. Spray the baking sheet once more with cooking spray and use a slotted spoon to transfer the tofu to the baking sheet, spreading the tofu out so the cubes aren’t touching. Return tofu to oven and bake for 6-10 minutes or until the tofu is caramelized to your liking and crunchy on the edges. Remove from oven; set aside. 6. 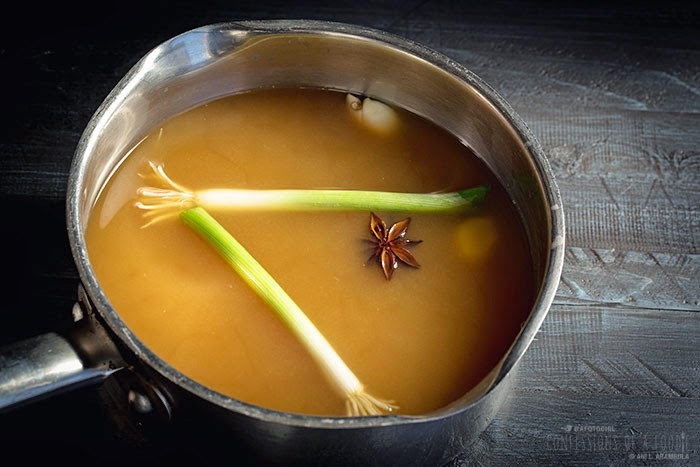 Fill a stock pot with water and bring to a boil. Add soba noodles and cook for 4 minutes. 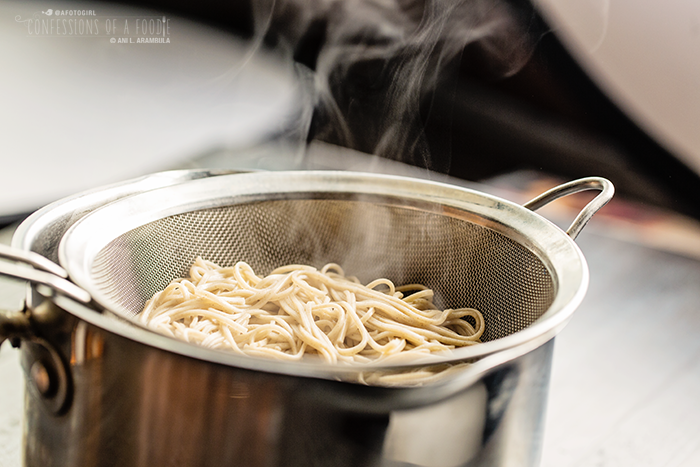 Remove soba and rinse well under cool running water; set aside. 7. Heat a skillet over medium high heat. 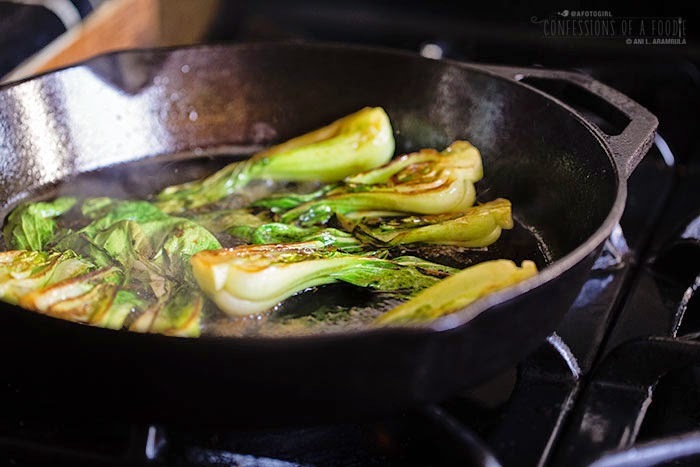 Drizzle in oil and when oil is hot but not smoking, add bok choy cut side down. 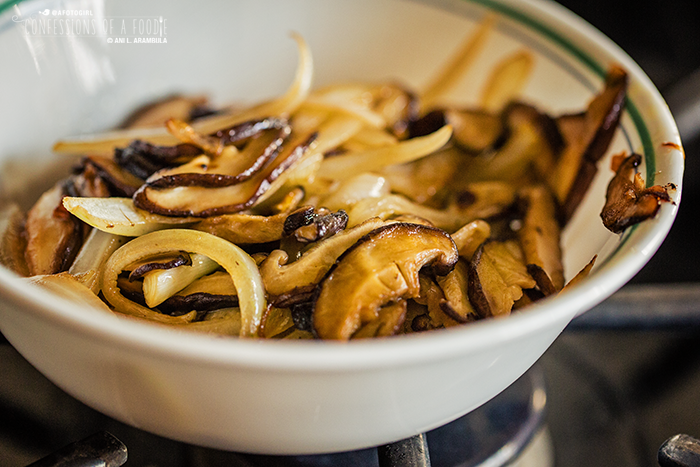 Allow to cook undisturbed for 5 minutes or until starting to caramelize; remove from pan and set aside. Add remaining oil to pan and when hot, add onions. Cook, stirring, for 3 minutes. 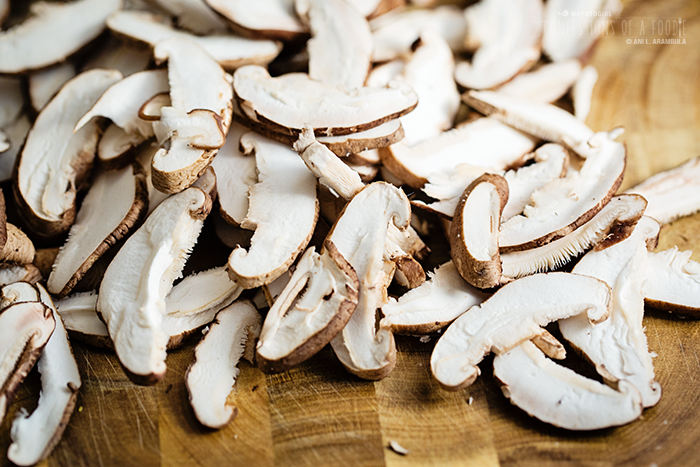 Add shitake and cook an additional 5 minutes, stirring occasionally. Remove from pan to a small bowl and set aside. 8. 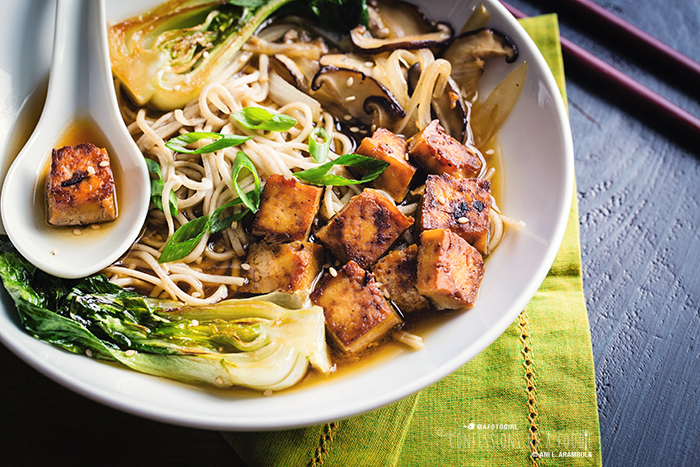 When ready to assemble, divide tofu, noodles, bok choy, and onion mixture between four large soup bowls. Ladle hot broth over the noodles and vegetables, dividing broth evenly between bowls. Garnish with chopped green onions and sesame seeds. Store leftovers individually, heating each up separately and assembling when ready as instructed here. Beautiful dish - I can't wait to try those soba noodles - thanks for the tip! 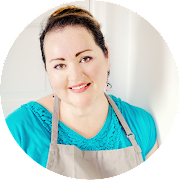 Thanks for sharing this recipe, it is wonderful!~ Such great comfort food for a winter day!